On the anniversary of the deadly white civil rights rally in Charlottesville, VA, white nationalists will descend on Washington DC for “Unite the Right II”, on August 12, 2018. 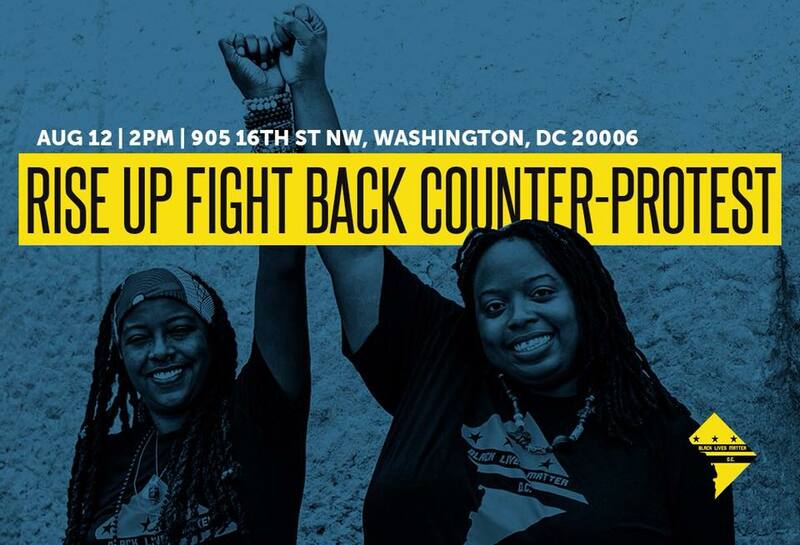 Organizers from Black Lives Matter, Black Youth Project, Black Leaders Organizing for Change, HU Resist, will gather to oppose white supremacist violence by leading the Rise Up, Fight Back counter-protest on August 12th, beginning at 2pm 905 16th St NW. For a movement that received national attention through civil disobedience, we are continuing our fight against white supremacy right where we started, in the streets, and we ask you to join us. We’re here to let white supremacists, fascists, neo-nazis and their sympathizers know that DC has driven out these types of white supremacists before and we will do it again. We are calling our supporters to participate to join us for a mass mobilization in Washington, D.C for Rise Up Fight Back March Counter-Protest. Our lives were forever changed on August 12, 2017, when neo-Nazis, KKK,militia members, and Alt-Right trolls from across the US and North America converged on the town of Charlottesville, Virginia for their Unite The Right Rally. White supremacists lit torches and attacked students as young as 17 last years old. The next day, people bravely confronted hundreds of armed racists. In the ensuing confrontation, one person gave her life, and many more were scarred forever. Tens of thousands immediately took to the streets. Suddenly the world would never be the same. Old statues fell. The Movement for Black lives hosted national mass mobilizations and the movement against white supremacy was reignited. We are clear,here is no real difference between the so-called the Alt-Right and neo-nazis, and the racist confederates of the days when Black people were chattel slavery — we are resisting the same deadly ideologies, and the the systems and institutions built by them. Now the white supremacists want to come back. On August 12, 2018, the Alt-Right will hold “Unite the Right 2” in Washington DC in front of the White House at Lafayette Square. Fascists have left a trail of blood through Washington DC. Richard Collins III, a Black Bowie State University student, was killed by a neo-nazi in May 2017. Days before Unite The Right 1, White Supremacist rode through Southeast DC—a majority Black neighborhood—openly brandishing guns and confederate flags. From July 9 to 20, 2018 ICE arrested 132 people in D.C. In the suburban communities around DC, sheriffs openly cooperate with ICE through 287g. This will not be the first time DC has shut down a KKK rally. In 1982, the Klan was run out of town when DC residents took to throwing rocks and bottles at them and creating a momentary insurrection against white supremacy. In that same spirit, donate to #DefendDC against fascism and white-supremacy on August 10-12. White supremacist, fascist rallies are all public displays of violence and calls for genocide. They are Brian Trainer and every killer cop. They are the ICE agents. They are the prison system that breaks up families. When ignored, fascism grows. And even when their movement is small, it can be deadly. Our Rise Up Fight Back Counter-Protest is for the victims of fascist violence and the families they leave behind. This is for the church members in Charleston, for Natasha Mckenna, Jeffrey Price, D’Quan Young, Ralphael Briscoe, Miriam Carey, Richard Collins III, Terrence Sterling, and countless others. We will be in the streets on August 12th, and we intend to win. Join us.